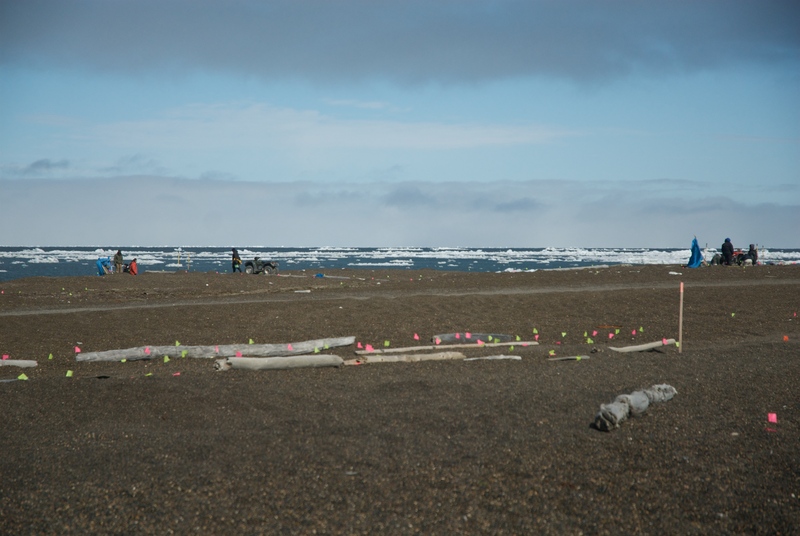 Conditions at Nuvuk are never ideal for excavation of burials, or most other features, really. The matrix (soil) is mostly loose gravel, so things don’t stay put too well and it is very easy to undercut or otherwise displace things before their position is accurately recorded. We have learned to take lots of photos, and record things with the transit as they are exposed, and that works fairly well. This past week was particularly challenging. We started the week with 3 burials located through shovel testing. Two of them were very close together, so they could not be excavated at the same time. It would confuse the EDM data recording program, and the excavators would get in each other’s way. 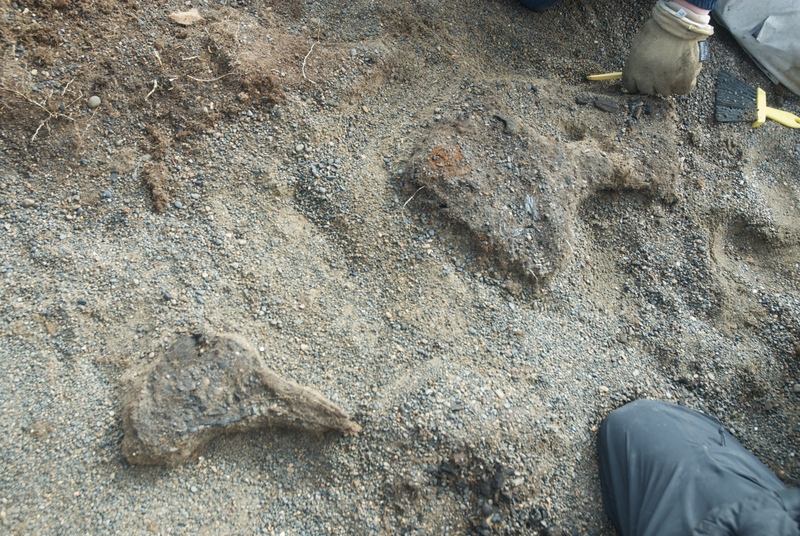 So we picked two that were separated by a good distance, and got them ready to excavate on Monday. It was really windy, and one of the burials had a bit of vegetation on top of it. In the Arctic, vegetation dies back each winter, but the dead stuff doesn’t decay, it just stays there. Once you start excavating and cut the vegetation loose, it can start blowing around. Some of the crew wore goggles to excavate. 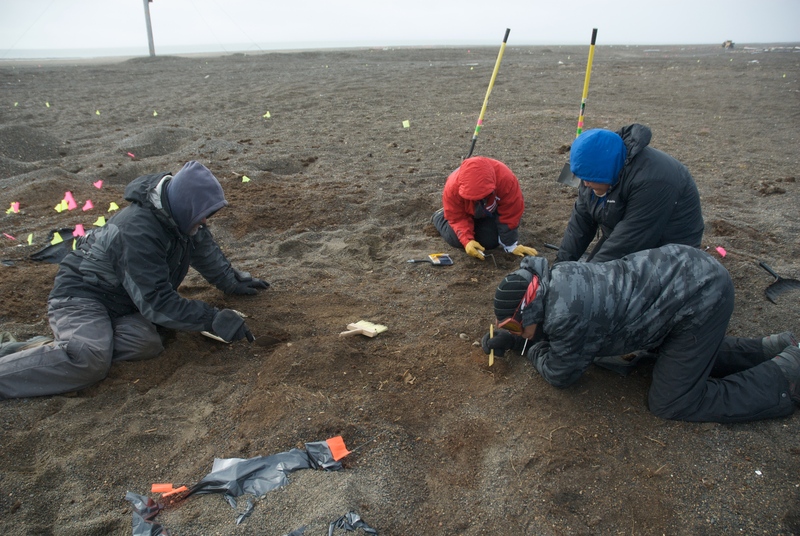 Dennis, Trina, Trace and Heather excavate the surface levels of a grave in a high wind. Needless to say, the construction of good windbreaks at both units was a priority. After that, life was a bit more pleasant for the excavators. On Tuesday we went to work in earnest. With excavation at both burials, I was busy on the transit. Both of my experienced transit operators were excavating, and things had to move so fast that it was not a training day. Excavation going on at two burials, as seen from the transit. I took the picture during the brief sunny period after the snow squalls were over. One of the burials seemed to have an intact wood frame around most of it. Oddly, when we finished the excavation, the lower body seemed to have been undisturbed, but the upper body was mostly missing. The grave was fairly shallow, and in the past explorers, anthropologists and others are known to have collected surface human remains, especially skulls, for museums. Most of those individuals have been repatriated and reburied, so it is possible that is what happened to the upper body. It is also possible that someone dug a hole and scattered the remains unknowingly. The osteologist will look at any human skeletal elements that have been found on the surface nearby to see if they are part of this individual and reunite the elements before the reburial. We were able to finish that burial on Tuesday. Unfortunately, this was not the burial that was close to the other burial, so the excavators had to switch to STPs. The other burial took longer. Once we got the vegetation off without anyone wrecking their eyes, we came down on several patches of charcoal, as well as most of the bones of a bird (probably a duck, although I need to look more closely in the lab to be sure). We spent a good deal of time defining the charcoal, prior to taking C14 samples for possible dating. In the end, it looked like maybe someone had made a fire and cooked a bird over the grave (probably not knowing it was there). The charcoal pattern was a bit odd for just a fire, and I think that the grave could have had some wooden framing elements which had been ignited by the fire on top of them, and smoldered into charcoal in place. So it’s not clear what dating the charcoal will date. Two of the charcoal patches in the process of being defined. As we continued excavating, it became clear that the individual’s bones were well-preserved, but were very jumbled. It appears that they may have been dug up, possibly even at another location, and then reburied in a hole where we found them. From the soil and the amount of vegetation over the grave, it is clear that this happened quite some time ago, possibly hundreds of years ago, perhaps well before the bonfire. Because of the jumbling, it took a very long time to document and removed the remains, and we weren’t able to finish until Wednesday morning. Once we got done with that burial, we immediately started getting ready to excavate the other burial nearby (within about 3 meters). I programmed a unit into the data recording software, and the crew started to work. First order of business was a windbreak, since it was still windy. We also tested several vegetated area we had reached at the end of last season and chosen not to test because they were really high probability burials and we would not have had time to excavate them. Two were negative, and the third turned out to be positive. We assigned it a number, set up a windbreak, and went to work on that one as well. It just kept getting windier. On Thursday, I didn’t get to the site until after noon, due to the radio show, so the crew worked on STPs and getting one of the burials ready to start shooting in artifacts as soon as I got there. This burial turned out to have a lot of artifacts, especially the “burial rocks” which we find in many of the burials, so we didn’t finish. With the small crew and bad weather on Friday, we will have to finish Monday. Posted on July 18, 2010 by Anne JensenPosted in Archaeology, Arctic, fieldTagged Alaska, Archaeology, Arctic, burial, crew, field, weather.